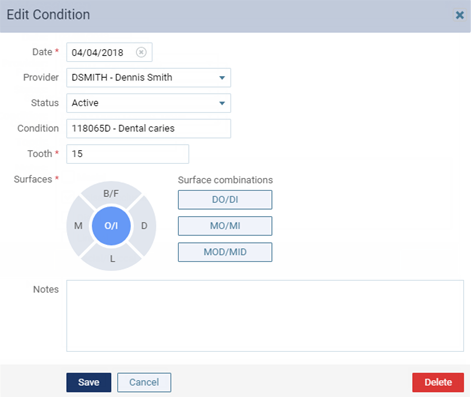 You can delete a condition in a patient's clinical chart as needed. Note: If a condition has been marked as having been treated, and if there is planned or completed treatment for that condition, to delete the condition, you must first change its status to Active and then save it. On the Progress Notes tab of a patient's clinical record, the procedure history for the patient appears. Select a condition. The Edit Condition dialog box appears.